Our comprehensive range of Delta AC Servo Drives is developed under the strict care of our professionals to offer maximum performance and precise functioning. The optimum quality raw materials ensure for high speed and high precision motion control. These are widely preferred by our clients for its smooth motor operation and low energy consumption. Our fine quality ranges of Delta Make AC Servo Drives are developed from optimum quality materials and they ensure high performance of the control circuit loop. They are developed with the help of highly advanced technology and are properly packaged to satisfy customers’. They also guarantee high seed and effective precision motion control. We also offer bulk deliveries within the specified time limits. 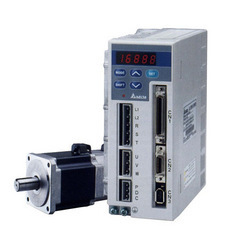 The series is a digital servo system which consists of highly standard functions. Plus, it also includes built-in position / speed / torque control modes and supports pulse command input and analog signal control. Furthermore, the parameters editing and operation is done with the help of an optional handheld digital keypad. The gain tuning function is needed for easy operation and the internal memory blocks are highly capable of shortening the parameters upload and download time. The b series is a highly cost-effective and satisfactory servo system which is adequately needed to fulfill the basic and highly functional requirements of industrial automation field. We have mastered the art of satisfying customers’ and are offering A Series of AC Servo Drives (Item Code-ASDA-A). It is a kind of omni bearing incorporated servo system and consists of modern functions. They can provide analog voltage signal control and pulse commands. Moreover, they are also adept at providing internal point-to-point position control mode (8 internal programmable registers). Our products also provide different internal control functions like feed stop control function, indexing, internal auto-running control mode, and move to home function. In order to fulfill the requirements and needs of motion control applications for multiple points, our products implement modbus communication protocol as a standard. We develop these products completely in accordance with the latest market standards and demands and choices of our esteemed and honored clients’. Programming is done via the built-in keypad or using Delta's free Windows® based software where the user can store, teach, and monitor the operation of the servo system.